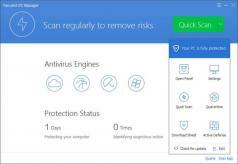 Tencent PC Manager is a free application that lets you easily keep your computer malware-free. The tool has an incredibly friendly UI, so practically anyone can use it. Once you launch the app, your computer will get real-time protection. The app quietly runs in the background as long as you set it to run automatically at system startup. Users can manually scan their files and folders in three different modes – quick, full or custom. However, there is no scheduler that would allow the app to automatically run scans on a regular basis. The custom scan, lets users select the drives and folders that should be checked, but also the most vulnerable PC areas sch as startup apps, system memory, frequently used programs and so on. Furthermore, Tencent PC Manager permanently monitors your PC, and any downloaded file is automatically analyzed. If it detects any suspicious component, you will receive a notification. Last, but not least, the program has context menu integration for Windows Explorer, so you can quickly scan any file or folder without having to open the program’s interface.